Love this comforter! Great quality and ordered one for my mom now!! 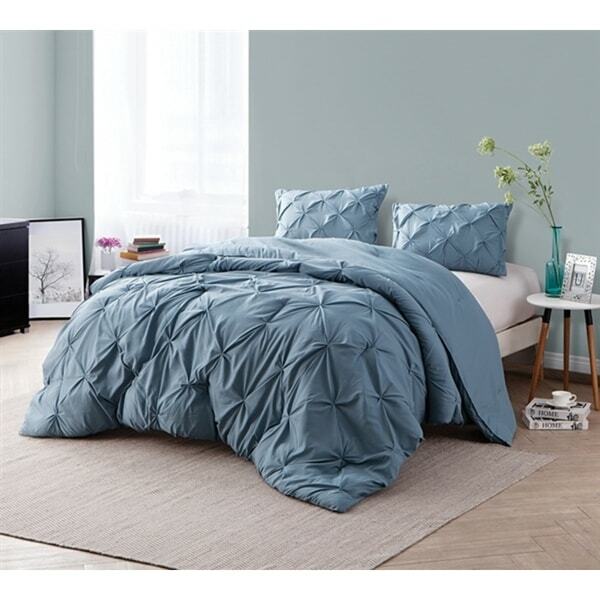 Style, luxury, and convenience are all manifest in this microfiber comforter. The comforter is machine washable. Featuring a 280 GSM inner fill, the comforter offers magnificent luxury. The comforter is available in several sizes to ensure you can find the one that's right for you. I had been searching for the right comforter set for my recently redecorated master bedroom for over 6 months with no luck or fear or I would spend too much on poor quality. When I saw this set I knew I had to take a chance. The price was perfect and the color was what I had been searching for. When it arrived I thought it was Christmas! The set was better than I could have ever expected! It fits my king sized bed perfect with just the right amount of overhang and it is full and fluffy and super soft! I hate a scratchy comforter and this is not that! 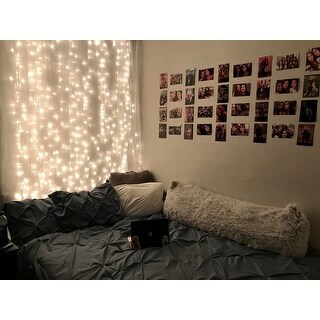 I am totally in love with my room now! Beautiful Smoky blue color... just what my daughter wants for her dorm room. The quality appears to be high although it has not been tested yet. The twin set comes with 2 shams which is a bonus I did not expect. Design is just as the picture indicates. Very happy with this purchase. Love this comforter! It is very comfortable and the color is exactly what it appears to be in pictures, a nice smokey blue. I would even bring myself to buy this product in the different colors they offer if I was in the mood for a change. I bought the product in a full size and it fits the bed perfectly. The only thing I suggest to remember when buying is this package only comes with the comforter itself and 2 pillow cases so be sure to buy your own sheets with this product. I love this product and am more than happy with my purchase! This is beautiful. I’m so happy with it. The color is spot on. It looks very luxurious. The quality is very nice. The color is unique and the photo is accurate to what it looks like in person. 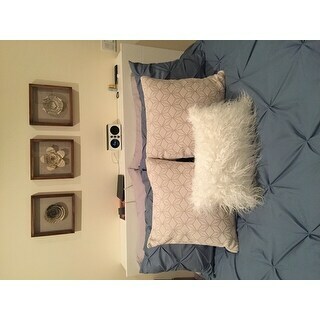 The material is not itchy and I like that the comforter is a little over-sized and hangs lower than other King size comforters I have used in the past. I do not like bed skirts so this gives the bed a full look without needing a bed skirt. Great value for price. Color is as show in the photo. pin tucks are consistent and well done. fabric is nice and soft. great comforter! Beautiful color- just as pictured. Comforter is very soft and a great weight. I expect to be cozy all year. Shipping was fast & items arrived well packed. I would definitely recommend this comforter. We love this! The delivery was timely. The comforter is very soft. We’ve washed it a few times and the pin tuck details didn’t come undone and the color did not run. High quality. I absolutely love this comforter. The color is exactly like the picture. It is so soft and warm. It is thick too which I was not expecting. Cannot go wrong with this set. Just as beautiful as the one I bought in Gray! Showed up as expected. Isn't super high quality, but worth the money. We hate feeling hot at night and this comforter is nice and light. We tested it out in our guest room. Would recommend. Gorgeous set and looks expensive. "your measurements for the king size comforter says 112x98. Is this correct measurement? or is this comforter oversized ?" The dimensions of 112'' x 98'' for this King comforter are accurate. "Why does this. say it doesn't include shams but. The details say t here are. 3 pieces. How do you get shams to match?" 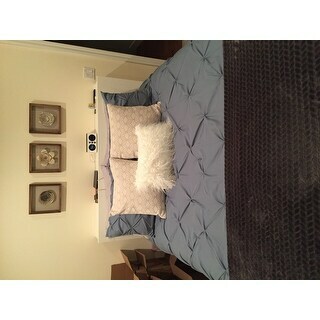 The sham(s) are included with the BYB - Smoke Blue Pin Tuck Comforter. We apologize for the confusion we might have caused. This product does not come with fitted sheets or loose but it comes with two pillow shams. I decided to buy nice offwhite sheets and it styled very nicely. Great product. "what is the texture of the fabric? Does it have a suede-like texture or more like a cotton-linen"
The outer material is Microfiber which has a soft smooth feel. It does not have a suede-like texture.